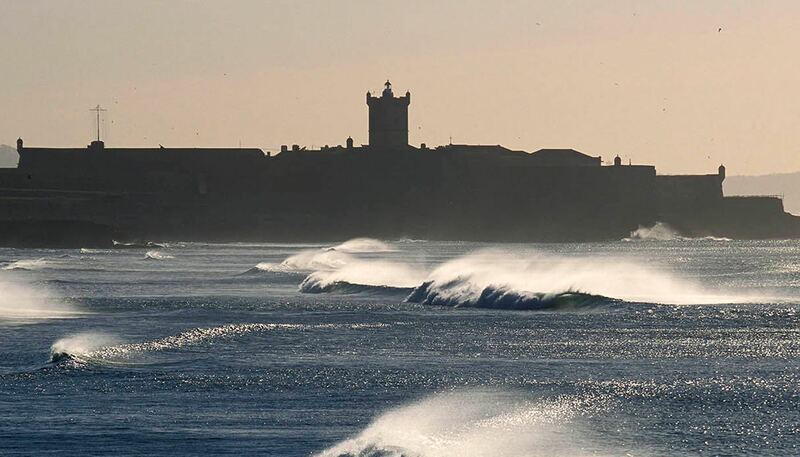 Guincho Beach (Praia do Guincho) is Portugal’s kite surfing mecca – it’s where the Kite Surf Pro (KSP) World Championship Tour regularly kicks off. It’s popular with everyone – surfers, kite boarders, body boarders, wind surfers and beach bums. This sandy beach break is best for experts, and can get crowded. Local shops offer kite, surf, body board and stand up rentals and classes, and there are several spots for lunch and dinner in a range of prices. Guincho LIVE as if you were there! 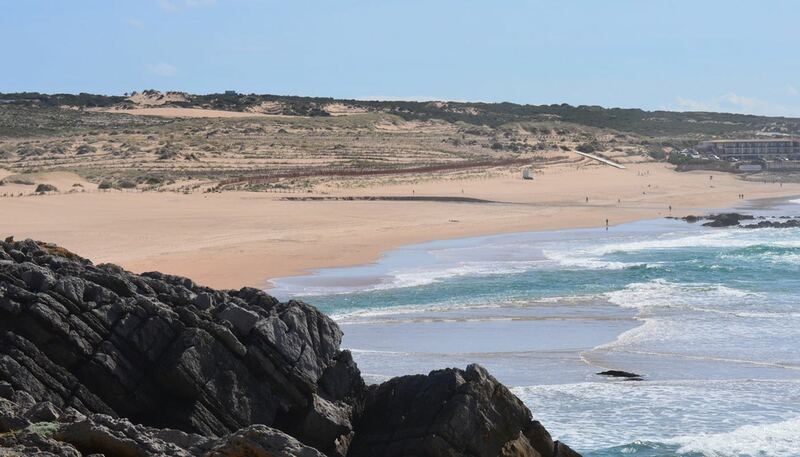 Watch stunning views of Guincho Beach Portugal, surfing conditions or kite surf in real time, waves and winds conditions from Live Beach cam. June to September are the best months for kiteboarding, when the wind blows from 15 to 25 knots, and up to 40 – but good wind comes in from May to October. Best directions are N, NW and W; N and NW are the dominant directions. The saying goes that if there’s sun, you’ll have wind in Guincho – even when there’s nothing in the rest of Portugal. This is due to a cocktail of local thermal effects caused by the mountains in the north, the big sandy beach and a cold water current at the shore. The NW swell comes in to Guincho with 1 to 2-meter waves over a flat sandy bottom – great for surfing with N wind, a bit choppy with NW winds. Mid-tide is best, and high tide requires a bit more commitment. A good 3/2 wet suit is usually enough, with booties if you get cold; a 4/3 wet suit will get you through any weather. 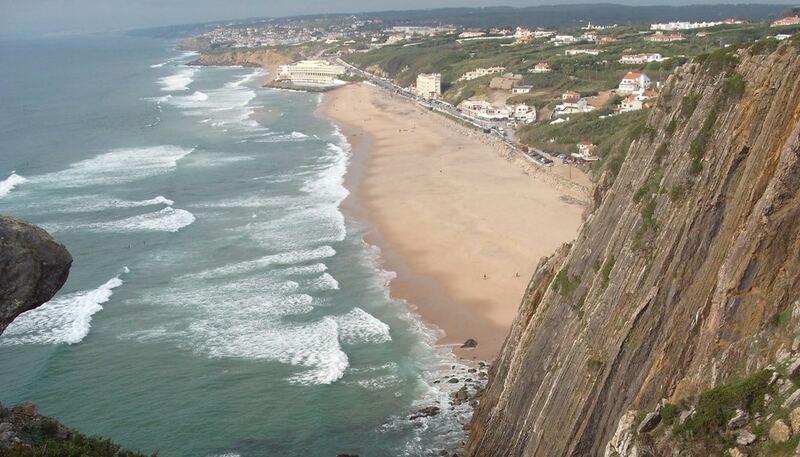 Staying in the hotels around Guincho will cost 75€ to 125€ per day per person in the summer, less in the off season. You can’t get closer to the break than Estalagem Muchaxo, a four-start hotel of yesteryear with lots of old-school charm, a private pool, and a great bar for that after-kite beer. If you want to keep it cheap, Camping Orbitur Guincho is a 15 minute walk away, and offers bungalows, caravan hook-ups and tent sites, a big pool, free WiFi and a restaurant with bar. Many more hotel options can be found just 5 km away in the town of Cascais. 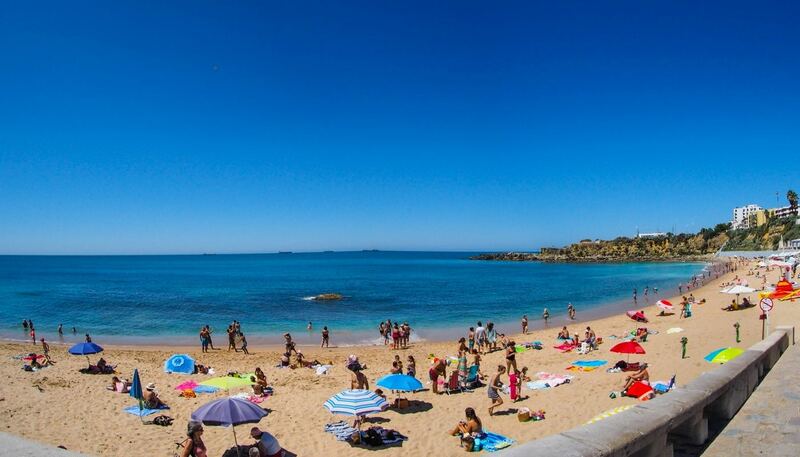 Guincho Beach is 37 km from Lisbon Airport – by car, take LIsbon A5 to Cascais and get off on the last exit, make a left, and a right at the first roundabout – N247 will take you straight to the beach. You can also reach Guincho by train and bus. 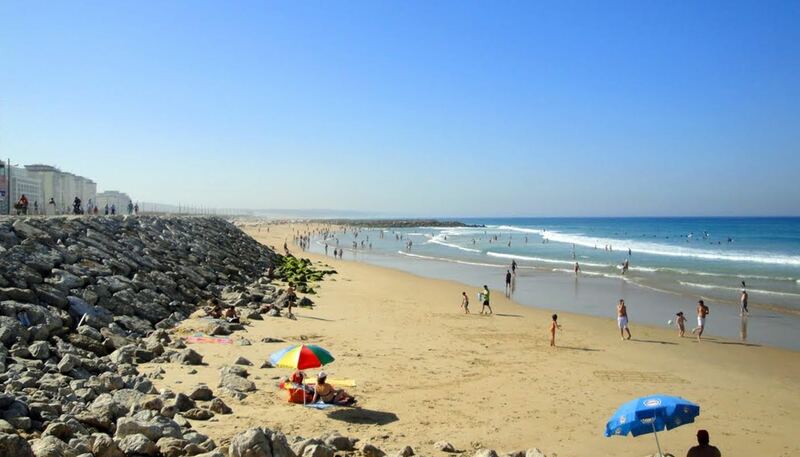 Guincho is 5 km from Cascais – a tourist town full of hotels, shopping, dining and night life catering to all tastes. Cascais is a 30 to 40 minute train ride from Lisbon’s Cais do Sodre train station; near the Cascais train terminal, there are buses and taxis that can take you to Guincho. Or with an ID, you can rent a free bicycle. Sights: Just 19 km away in Sintra is an awesome Moorish castle, next to the fairytale Palácio da Pena, worth a day trip alone. Sintra itself is a pleasant town for walking, with plenty of cafes and restaurants. The more cosmopolitan Cascais offers fine dining, crowded but pleasant beaches, shopping and several museums and art galleries. In the summer time, Cascais hosts several music festivals. Read Guincho Beach Reviews on Tripadvisor.